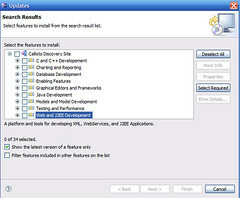 Eclipse as of today is the industry’s major non-Microsoft software tool platform. The number of companies adopting this platform is a testimonial of the platform’s success. Eclipse has a well-designed, and extensible architecture. What is valuable about Eclipse is that it provides an open source platform for creating an extensible integrated development environment. This platform allows anyone to build tools that integrate seamlessly with the environment and other tools. The key to the seamless integration of tools with Eclipse is the plug-in. With the exception of a small run-time kernel, everything in Eclipse is a plug-in. This means that a plug-in you develop integrates with Eclipse in exactly the same way as other plug-ins. Any new person who is introduced to Eclipse in concerned with one important question : How to Install Eclipse Plugins ? This approach seems to work fine in both windows and linux. I am not sure why this approach is not documented in Eclipse. I found out about this when I was using the trial version of RAD (Rational Application Developer). It was used primarily to manage product extensions. I believe the same concept can be used to manage plugins (Install/Uninstall). One of the problems with the above “link” approach is the plugin dependency resolution. This has to be take care of manually by the plugin installer. If the install is done via the UI, it manage to find and install all the dependencies. 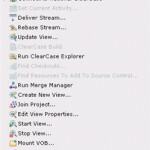 Staring from Eclipse 3.4, Eclipse SDK has a new provisioning system called Equinox/p2. The dropins folder is configured to be scanned during startup, and for changes to be immediately applied to the running system. Thus the dropins folder can be used much like the plugins directory was used in the past. A subtle twist on old behavior here is that plug-ins and features added to the dropins folder are properly installed into the system rather than being forced in. This means p2 has an opportunity to confirm that the new plug-in doesn’t conflict with other installed plug-ins, and it can even go out and fetch any missing prerequisites of the newly dropped in plug-ins. This also means you can later use the GUI to install extra functionality that depends on the plug-ins in the dropins folder, since p2 knows about them and can reason about their dependencies. In other words, new plug-ins installed via the dropins folder behave exactly like plug-ins installed via the user interface. Hope this post was useful, if you had any problems using this approach, do leave a comment with the problem description. Thanks to Bryan Solan for the Dropins reference. Hornburg, yes it might be faster by adding extension location. But if the scenario is working between multiple versions of eclipse and multiple versions of plugin, then u can easily move around the plugins. If you are doing it one time, I guess the “add extension location” makes more sense. FYI, i am one of the maintainers of an eclipse distros called EasyEclipse which install all its plugins like that. Philippe, checked EasyEclipse Pretty nice..But I didnt get by what you meant by “that” you use links concept or the Extension location concept ? How do I used environment variables in the .link file. Bhaskar, thatz an interesting question ! I have not used eclipse on unix environment, if it works it will be great. Can u check it and let me know ! I have tested this. This feature is not working. Thanks Bhaskar, for checking on that.. It might not be an easier way to install eclipse plugins, but for sure it is a better way to install and maintain eclipse plugins. I’ve been using this technique for ages. I discovered it after installing MyEclipseIDE and seeing how it installed. * I keep a copy of each .link file in the /thirdparty folder so I can quickly select and copy the plugin’s I want and paste them into Eclipse’s /links folder. It also helps prevent typo’s because you only have to get it right once. * The .link files have the EXACT same name as the plugin folder. I don’t completely agree on the first point, its not mandatory for a file name to have version. I use several Eclipse configurations with the same Eclipse install and so run Eclipse with different values of “-configuration” parameter. Different configurations may have different sets of plugins, including different versions of the same plugin that would conflict if installed in the same configuration. For such case, I believe the only way to go is to use extension locations, because links are shared between configurations and extension locations are not. Nevertheless, I have several plugins shared among all the configurations I use, so links-based approach will simplify the process of management of such shared plugins. I have read about the -configuration argument, however I have never found out a way to use it properly. I tried “googling” around but couldn’t find much. How is that argument used ? When setting up the new configuration I just copy the “configuration” folder from the eclipse install to another location and then launch eclipse like “eclipse -configuration new_config_dir”. So, info related to all the plugins I add via configuration manager is stored in the new_config_dir instead of the eclipse/configuration. I repeat the procedure with another directory when I need a different set of plugins. Has this links folder and links file technique been used successfully by anyone on any of the Rational version 7 line of products? I can enable my plugin using the “add an extension location” GUI operation, but RSA, RSM and RAD appear to completely ignore the links folder. I installed a plugin using software help->Software updates ->find and install link in RAD. How do I uninstall it? This looks ideal for me as I want to try several plugins before deciding which ones to use. Unfortunately it seems to work some of the time but not all of the time. I tried the technique with CFEclipse and Aptana and they work well, but JSEclipse did not show up as a perspective when I tried that. Should it or does it work some other way? Also wnted to use XML Buddy but it did not seem to have the right directories when I unzip the distro. I have loaded lots of plugins using this approach and none have failed. Even if they have, its because of my mistake in not conforming to the folder layout. The .link file should point to a directory which has eclipse directory and this eclipse directory should have plugins and features folder. If both of these are fine, then your plugin might not be loading because of some missing dependent plugins. Start eclipse with a -clean option and check Error Log View in Eclipse. You should find logs if any plugin is not loaded properly. i installed the “metrics plugin”(web: http://sourceforge.net/projects/metrics) to find the code metrics in RAD. Usually after installation in Eclipse, i will select a project and right click on it to see the ‘properties’ and ‘Enable Metrics’ in that view. But in RAD 6.0.1 (Eclipse version 3.0.2) it is not working. Can anyone verify this? Kindly tell me how to solve this problem, as i have to run the metrics plugin in RAD 6.0.1.
by the way, your method works fine in eclipse (3.1) but in RAD eclipse it doesnt. i was talking about version 6 of RAD… can u plz tell me whether this works for version 6 also?? Yes, it does. If you look in the …\IBM\Rational\SDP\6.0\eclipse directory (assuming you’ve installed to the default location), there’s a links folder already there, and IBM actually has several files in there when you first install the product (com.ibm.rational.rad.link for example). Put your .link files in there, and it should work, as long as your plugins work on RAD 6. In the version 7 line (RSM, RAD, RSA), this no longer works. Why IBM seems to like removing features, then selling it as an upgrade, I’ll never understand. just tried and did a fresh install after having read this post (and a few other on the topic). And I couldn’t have the “windows” way to write the path to work…. And I couldnâ€™t have the â€œwindowsâ€? way to write the path to workâ€¦. Tam I didnt understand this part of your comment. Did you have any trouble with “links” approach ? I tried your suggestions to understand why the JSEclipse plugin is not working but can’t see any problem with the .link file or athe way the path is written. It’s just like the others and they all work. I have decided that it is probably that it was built for Eclipse 3.1 and I am using 3.2. I guess I have to wait for a new version. Kevin, I tried to test it out, but seems like its acquired by Adobe and requires some login to download. Does anyone know how to install eclipse v3.3 in RAD 7.0.
i have a question… the Tail plugin for Eclipse (version 0.5.0), works in eclipse 3.2.2 with MyEclipse 5.5.1 GA?. I have a copy and a tried to install but don’t work. It doesn’t work for me with the Subclipse plug-in and there is no error log report for it. It installed fine with the update manager. What I did notice was that when installing with the update manager I had to agree to license conditions before installation. Could the lack of license agreement be what the link method is getting blocked by without reporting an error? The Tail Plugin is very old and was last updated on Nov 18 2003. Probably the plugin api no longer works with Eclipse 3.2.2. When you start Eclipse, have a look at the “Error Log” view. The view shows details on plug-in load failures. The license page in the update wizard pops up for every plugin installed via the update mechanism. extracted the contents and copied it to a folder structure like this. I also created a “link” file pointing to the Subclipse folder <code>path=D:/europa/subclipse</code> and I was all set. I could configure settings via the SVN preference page and also switch to the SVN perspective. As mentioned in the post, one thing to note is the folder hierarchy. For E.g. If you have forgot to create a “eclipse” folder inside “Subclipse”, the plugin would never load. I’m doing something wrong and would appreciate an extra set of eyeballs to get this installation method moving forward. I have a very simple jar file that, when, copied to the eclipse/plugin directory, works perfectly. Restarted Eclipse. No errors messages were encountered on startup and nothing was logged in error log file. Tried all combinations of the above files. Just the jar file, just the files themselves, and all files. The files were not listed under the help>> cheatsheets. Jim, with eclipse 3.2 and above, you don’t need to extract the JAR file. you seem to be extracting at c:\tpplugins\aaa which is wrong. Bingo!! I feel like Uncle Eddie in Christmas Vacation. Copied jar file to C:\tpplugins\aaa\eclipse\plugins. The world was right again. I wanted to locate where I had problems with the original directions. I think it was with step #3 in the original article. I certainly didn’t get it. Well what was copied and, really, where was it copied? Venukb, I can’t thank you enough. Your reply made a difference. I was ready to throw in the towel. I did re-read the post again. If you notice, I do mention WTP package and its hierarchy before staring with the steps. Irrespective of this, I will definitely change point 3; I myself was confused a little bit by the ordering. How do the feature loading methods (update, .eclipseextension, .link) differ from the plugin perspective? When using the update manager duplicate plugins don’t seem to be downloaded and versions are checked, so when you restart eclipse it doesn’t spend wasted time trying to load a plugin that has already been loaded. When using the .eclipseextension; if there exists a plugin in the eclipse/plugins folder that also exists under the eclipse folder pointed at be the .eclipseextension eclipse seems to go through and verify it isn’t already loaded and if it is it writes to the error log. When I try to add subclipse 1.2.4 as an extension through Manual Installation, (Subclipse->eclipse->has plugin and features folders); it says there must be a .eclipseextension file which is not there. Do we have to create it by ourselves? But when I followed the links path, it works fine. I’m trying to create a links folder with link files inside for an exported RCP application (I export my application with the eclipse wizard and then I create manually the folders). Have you already tried to do that? Thank you very much for this article. Very useful. I am unable to install for some reason. I was trying to install Hibernate Tools. Am I missing something here. I have eclipse 3.3.2 installed on my machine. Do I have install something more or am I missing something here?? Thanks very much for that input. Will update the article with this info. What is the error that you see ? About the JSEclipse plug-in I tried the method described here to load it from a third party plug-ins folder and the first time the plug-in loaded just fine. After a workbench restart I saw the plug-in didn’t load at all and went to the config manager just to see that the plug-in was disabled. What I did next was enable it and restarted the workbech once again to what it was disabled again. I repeated the process but instead of restarting the workbench I just applied the changes without any restart and the plug-in is working just fine. Any ideas why this happens? Does JSEclipse conflicts with any other feature? Hope this might help a bit. Very good way and it worked with me well. (2). Strings 0f the corresponding link files (in the link folder) must be changed according to the corresponding plug-in new position. Apologies for the late reply. Regarding JSEclipse even Kevin also had a similar trouble. So I went ahead and tried installing JSEclipse using Links. When I fired up eclipse, saw a message in the Error log saying “could not find feature.xml”. I am out of touch with eclipse from some time, but for some reason, eclipse could not find the feature.xml which was in the archive (feature jar file). I extracted the contents and deleted the archive and restarted eclipse, seemed to work fine ! Try it and let me know if it worked for you. Even if you move the entire eclipse directory, there is nothing to be done since the links point to the same external directories. 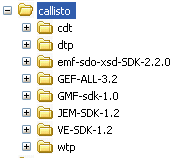 Note that you should ideally keep the extension folders out of Eclipse directory ! If you do rename or move the link folders themselves, as you have pointed out you need to update the string. where my eclipse directory is the root. Thanx, Venu. Live long and prosper! Thanks Venu, Keep Up the Good Work ! This approach seems ok but it is not appropriate for a portable Eclipse installation (I carry my Eclipse + Workspace on a portable harddrive). The Update Manager > Add Extension Location is more feasible and recognizes the change via relative location. Although after adding the extension you could only remove it manually via eclipse install>configuration>org.eclipse.update>platform.xml. Anyway, thanks for the info.. I have walked through your steps first. This work fine with RAD7! I have tried with Visual Swing with no success (Eclipse 3.4.1, Windows XP). It is not show as Installed Software or Available Softwere in Help -> Software Updates. BTW, Visual Swing ZIP file does not contains a features directory. I tried this link approach it is working fine but when i removed links folder still i am getting those linked plugins. how can i uninstall those plugins. Please help me. I have never tried giving a relative path in the link file. It might work I guess. Features is not always required by eclipse plugin contract as far as I know. I haven’t tried this approach with 3.4. Are you seeing the functionality of the removed plugins? Thats surprising. In any case you can do eclipse -clean This re builds the plugin cache and you should be set. Thanks for your reply, after removing the link file i opened eclipse with -clean option but still i am seeing the functionality of the removed plugins. please help me. What do i need to do? Tried this with latest eclipse installed fresh on 24Feb2009. It is the “Ganymede” version, C/C++ platform, downloaded from eclipse.org, version 3.4.1, detailed info below. Tried the Subclipse plugin, triple checked that everything is as described in the article. It does not work. I see that the feature has apparently been removed from some versions of Eclipse. Does anyone know if that is the case for the latest “Ganymede”? How could I use a plugin directory that resides on network? Did you get any solution for your problem. I have a similar requirement, and I am a newbie to Eclipse plugins, and I did not find a proper solution yet. Your help would be much appreciated. I am a newbie in eclipse. I have tried the basic thing of copying the contents of features and plugins and pasting it into the respective folders but it didn’t work. I mean, I am not getting the required API when I try to write the program. great post venu. Thanks. LEt me give this a shot. and how do I launch the plugin inside Eclipse? In a text document; a missing feature folder shouldn’t matter..
i am working in a project on eclipse.i have to install manually developed plugins in eclipse.how can i do this? I was having issues with ClickIDE plugin with Eclipse3.4. Initially I had it working (by manually extracting the files) but later I deleted the plugin as it was throwing some exception. Later when I re tried, it (clickIDE plugin) does not even gets loaded. Not sure what when wrong. I have installed Aptna plugins between ‘deleting’ and retrying the installation. After reading this post, I tried but of little use. Said plugin still does not gets loaded. Someone please help. Is there any log file generated while starting Eclipse, which tells which plugins got loaded and which had problem loading. Sg, is .lnk for Linux/unix ? It’s amazing!!! Thank you so so much..I’m working with Eclipse Galileo 3.5 and I found that when replacing / in “path=” by // it works well. Once again thank you for sharing such awesome article! I am new to eclipse. I find this approach very useful. Is this supposed to work for RCP products you’ve created, or only for Eclipse IDE? It worked for me on eclipse 3.1. I think its the simplest way to manage plug ins.Thx for this idea. But, what is the best way to confirm whether that plug in is now available in eclipse? Is it listed under plugins ? Thanks! this article was really helpful to me. my task gets easier. Thanks for the information.I did my plug-in installetion by following your information. 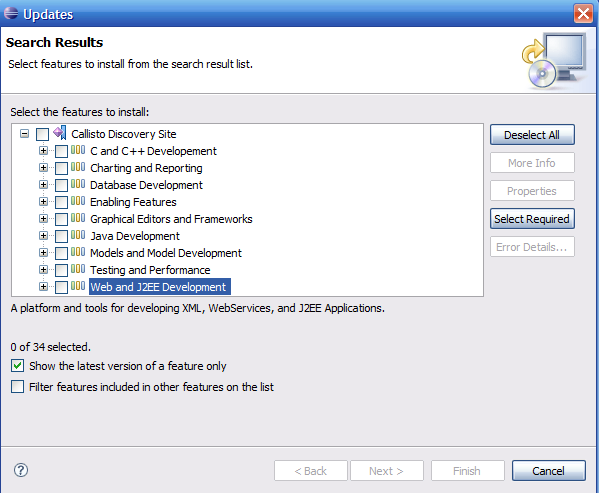 links directory still works in Eclipse 3.6.
but in doesen’t work properly for me and eclipse doesn’t Recognize the cpp plugin!! This feature seems to be superseded by the ‘dropins’ folder in recent versions of eclipse (p2 provisioning system). Allegedly the ‘links’ folder mechanism is still supported but I haven’t had much success with putting a .link file in either ‘links’ or ‘dropins’ in Helios. Thanks for the reference Bryan. That’s very useful indeed. I always do the hard way when I need to move my installation to a new or other computer. Although sometimes I prefer the convenience of the update manager, I’ve been, like you (and many others), left several times with partial installations, which are a pain in the arse to get it clean again. Using the \links\ provides for a much better way to compartimentalize the plugins from Eclipse itself, and if it fails, you just unzip again the contents, or easily remove the link-file to get rid of undesirable plugins. Thanks for the article. Very informative one. Actually I’m working on Developing Mashups on Google App Engine. For that I need to install PyDev, a python development plugin for eclipse. But I did not get that. So I downloaded Pyeclipse. But I’m not understanding whether it should be installed as a link as you explained in this article or in some other way. Because that it does not have folders like features and plugins. Could you please help me out in clarifying my doubt? Thank you for this explanation. It was very helpful. because the installer is a freakin nightmare !!!!!! I came across your article exactly when i m looking to install WTP directly by copying to plugins folder. Thank you very much for giving detailed instructions. Here’s a link (40MB) to the files. I found trying to install SDK or PDE plugins into the above environment was proving (for me) impossible. (Missing connectors, incompatible versions, and all sorts of other errors). I have now downloaded eclipse-SDK-3.6.2-linux-gtk-x86_64 to develop plug-ins, and then I’m using links to plug them in to my PHP development environment. Works great ! By the way, I inadvertently failed to name a link file with the ‘.link’ extension, and linking still works with a link file named ‘Unsaved Document 1’ !! I urgently need to get Java3D to work with Java 1.6 and Indigo in Windows 7. In the past with Vista and older Java, eclipse and Java 3D versions, I simply installed Java3D normally and it would work. Now however, this does not work. So, I tried putting in the new java 3d eclipse plugins. Copying the plugins and features into Indigo did not work. After deleting and setting up a new eclipse, I tried your links method using Notepad to make a file “java3d.links” with the line “path=C:\\Java3dPlugin” (also tried \ and /) indicating where I copied the unzipped download in an eclipse folder. Still no luck. Any ideas? i tested wtp eclipse plugins is ok, but not work for the googleAppEngine plugins. it is not easy to find and download the standalone eclipse plugins, since it is more common to use an update site(e.g. egit plugins). I just implementing a new plug-in and I have placed abc.txt file in my current project and I am trying to read in start(), but I am getting FileNotFoundException: abc.txt while running plug-in. Any one please tell me how to read txt file in current directroy not in any other location. I have some plugins and I exported them into a feature. After that I tried to install the new feature using your instructions but no result for me. Got quick installation with Links help. Super thanks. Thanks for the info, this helped me very much. It didn’t work for me initially using just the links directory, but I was able to get it working from the dropins directory using the .link folder. I think what my problem was that I used an environment var $HOME to reference my plugin, but it worked after switching to an absolute path. I’m on osx.